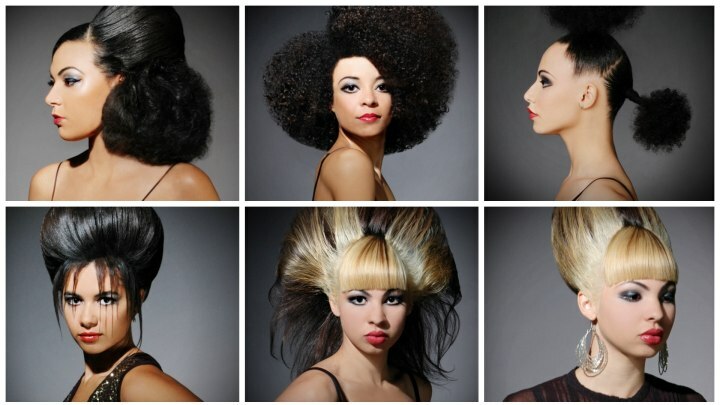 As the title says this collection of hairstyles is all about GLAM! And it comes in amazing, bombastic shapes that will take everyone's breath away. The inspiration of 50's and 60's music divas, goddesses of soul like Diana Ross is evident, but the styles are everything but retro. The extravagant, daring and exaggerated shapes pay homage to styles of the middle of the last century but they are all new and will still hold their fantastic aura in the 2050s. Abstract poufs, huge afro-style volume, high and higher updos with sleek surfaces and a lot of surprising style elements are what these new regal hairstyles are made out of. Pushing the hair to its limits, Nicky Oliver uses not only texture but also brightly contrasting color effects to enhance and play with the shape of his exotic and bedazzling glamorous creations. Two perfectly round poufs dominate the rhythm of this sculptural work of fine hair art. The curly afro hair was parted from the top of one ear to the other right across the middle of the head, allowing just a little bit more mass in front. Pulled tight the hair stays snug to the scalp where it was treated with a shine gel. It was then wrapped with color matching black ribbon before it explodes in a big round puffy creation. To add more drama the back is a touch smaller and sits on a longer "stem". This glam-mermaid look makes a great appearance on any stage and will be the eye catcher of any party. Incredibly bulbous volume was created by piling all the hair upward and smoothing the outer surface with shine providing products. Individual strands were left out to surround the head with long tendrils that were halfway twirled to create wide and thinner sections. Diana Ross became famous for her voice but also for her glamorous looks. 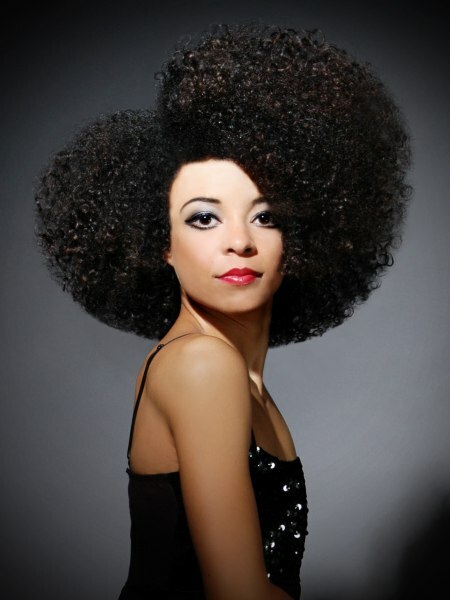 This afro style with its defined outline and distinct structure of curls reminds of how she puts the diva into hair. 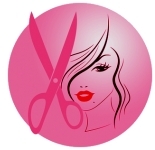 Parted off center a stylish asymmetry develops and hugs the face with between two curved sides of one divinely rounded cut that allows each little curl to shine as much as it can. A little black dress deserves a perfectly matching hairstyle and this asymmetrical updo might just be the one! The smooth and sultry construction features a range of shapes and textures all brought together in glamorous harmony. Slick and smooth surfaces compete with the passionately curly lower section for attention. Lots of volume around the neck and a highly styles, elegant section above the ears bring seductive drama back into hair fashion. With its immense volume, distinct cutting lines and perfectly balanced shape this gravity defying updo would already make for a big entrance. 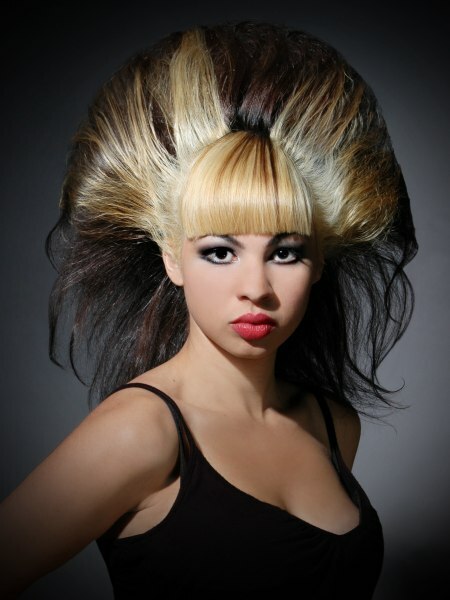 But it is the play of colors - multiple blonde shaped over black - that takes this look into a whole new realm. The laser sharp bangs are just one of the highlights and died in medium honey blonde with a couple of streaks in a warm brown. The strictly defined updo from the previous picture has a wilder twin sister. 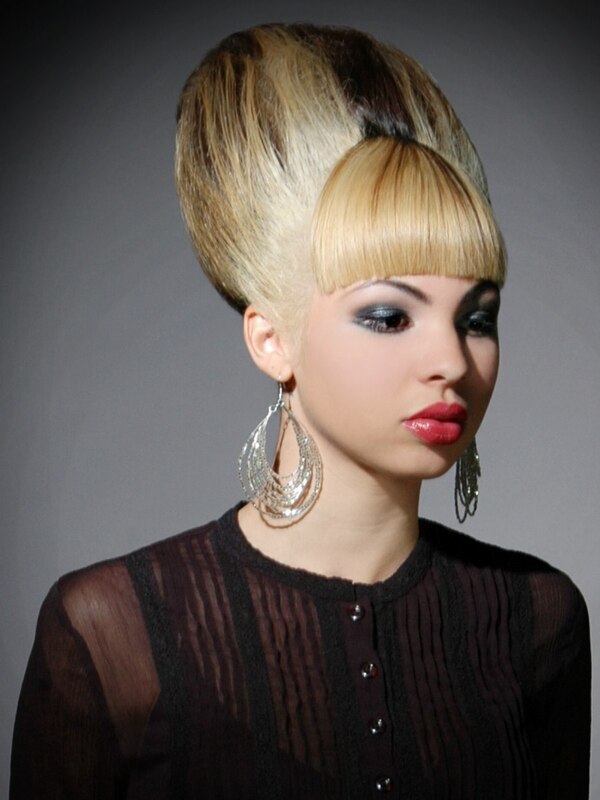 Here is the same hair but styled with open back and sides. The front still boasts a surge of contrasting colors rising high in a smooth swell before they disintegrate and shape a round veil of silken threads that magically keep their shape.